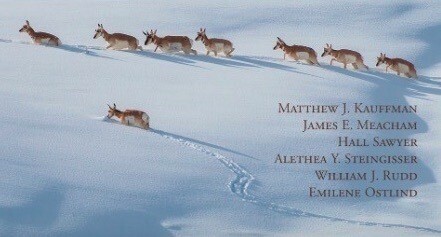 By Matthew J. Kauffman, James Meacham, Hall Sawyer, Alethea Y. Steingisser, William J. Rudd, Emilene Ostlind, Wild Migrations: Atlas of Wyoming’s Ungulates. Corvallis: Oregon State University Press, 2018. Conservation has often involved drawing lines around habitats, which often are summer range of terrestrial species, especially important hot spots. This has been good and necessary work, but not often has the definition of habitat encompassed migration corridors which can be long and narrow and difficult to protect from surrounding human communities. All sorts of developments, but especially roads, have bisected these long corridors, cutting off migrations and reducing the viability of migratory animal populations. Recognizing this, researchers today are using technology to trace migratory routes in hopes of protecting them and thus conserving migratory species. Such research is especially important to rewilding work, which seeks to protect and restore connectivity on the landscape necessary for conservation of biological diversity. Migration is only a part of the challenge of allowing species to move across landscapes, seascapes, aquatic environments, and even through the air, but it is an important part. When Yellowstone National Park was established in 1872, Americans were still in the grip of what Stewart Udall in his book The Quiet Crisis called the “myth of superabundance.” Dramatic decline in the late 19th century of populations of ungulates like bison and even deer and extinction of species like the passenger pigeon and Carolina parakeet, weakened the myth, and wildlife conservation emerged as part of a broad conservation movement. Back then, understanding of wildlife ecology was very limited. More than a century later that understanding has advanced dramatically, as Wild Migrations illustrates. This book is an atlas unlike any that I have seen. Its focus is on the state of Wyoming in which two national parks, Grand Teton and Yellowstone, are very much at the core of migrations of elk, bison, and mule deer. Many migrations in the state do not touch on these national parks, but the point of the book is that migratory ungulate populations, once nearly eradicated by overhunting and other factors, are mostly on the rebound. This recovery, however, is threatened today by energy development, roads, rural housing development, fencing, disease, and climate change, among other stressors. Long-term assurance of viable populations of elk and bison (moose as well, recent returnees) requires scientifically informed policy. Migration research, presented in this elegant 208-page book, will contribute to this goal. The Wyoming Migration Initiative was launched to contribute to the goal of sustaining migration corridors, which would require much research to determine where those corridors are and what measures are needed to sustain them. Wild Migrations is a report on the research done so far and its historical context. Its atlas format is intended to make that research accessible to many decision-makers. The goal of the project was and is to produce results that can be used in development and conservation planning and management to assure that migration corridors are protected. All major sections of the atlas are chock full of information provided as text, maps, charts, graphs, timelines, illustrations, and photographs. 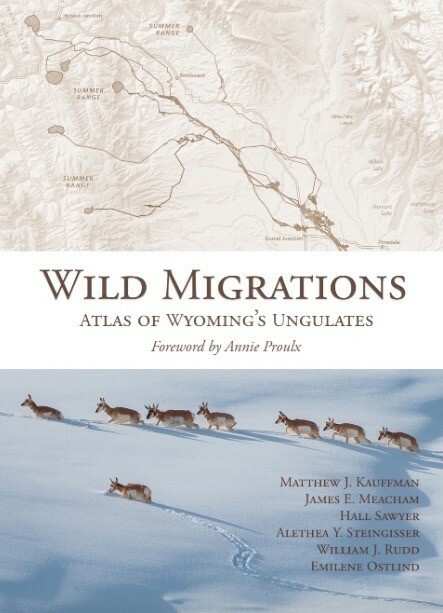 The introductory section provides an overview of migration – what it is and why it is important – an overall picture of migration in Wyoming, and relevant information about the migratory species studied including mule deer, pronghorn, elk, moose, bighorn sheep, bison, white-tailed deer, and mountain goats. Next is history, describing what is known of ungulate populations in times before trappers and explorers, the decline of populations by “exploitation and overharvest,” followed by population recovery. A section on science describes the history of migration research, explains data collection and analysis, and presents what has been learned about stopovers, “surfing the green wave” (how migration follows seasonal green-up), fidelity (to migration routes), and predation, among other topics. Final sections describe threats and conservation. An atlas like this could not have been produced until very recently with development of technology that allows precise tracking of migrating animals. Global positioning system collars and “store on board collars” allow researchers to accumulate mountains of data over long time periods. “A few animals wearing GPS collars can record tens of thousands of locations in a year or two, greatly expanding our understanding of seasonal ranges and migration routes.” Researchers then use statistical techniques to outline polygons of winter and summer ranges of each animal, then “merge individual migration routes to high- and low-use migration routes, stopovers, summer ranges, and winter ranges for the entire population.” This sounds like an immense amount of work, and it is. The result is detailed information about migration routes which can be used in various ways, though migration researchers admit that there is much yet to learn. Complementing all this research technology and analysis is Geographic Information System cartography which allows remarkable visualization of the data collected. The cartography in the atlas is the work of the University of Oregon InfoGraphics Lab, and the maps and graphics in Wild Migrations are remarkable. For instance, one full page, eight by eleven-inch map, titled “Population-Level Migration Corridors” overlays mule deer migration routes, winter range, summer range, stopovers, low-use corridors, and high use corridors on the physical geography over a 65-mile distance. Another map titled “Greater Yellowstone Ecosystem Elk Migrations” displays migration routes of nine elk herds, each herd’s routes presented in different colors clearly indicating how elk migrate in and around Yellowstone National Park. A third map presents the “Path of the Pronghorn” in western Wyoming, a 100-mile migratory route, along which are a Forest Service Protected Corridor, conservation easements, BLM Areas of Critical Environmental Concern, wildlife overpasses, and well pads. Challenges and conservation efforts along this path are clearly portrayed. The book contains hundreds of such maps and other graphic displays of the information gathered. While this is a Wyoming project, the most exciting aspect of this publication for me is what it reveals about the conservation potential of such work which, if done more widely in the American West and across the world, could be a giant step forward in wildlife conservation. Ungulate migration corridors are as yet more intact in Wyoming than in most other states in America, and the wildlife there is more abundant, but the research technology, methods, and the GIS presentation of it shows great potential for use in a range of wildlife conservation challenges. I learned of the Wyoming Migration Initiative through photographer Joe Riis’s marvelous 2017 book Yellowstone Migrations. The photographs in Riis’s book are wonderful, and there is text, but I was left wanting to know more about what is being done to understand migration and to protect migration corridors. Wildlife Migrations gives me just what I wanted after poring over Yellowstone Migrations. Conservation is the avowed goal of migration research and this final section of the book describes the Red Rim Fence Dispute that stretched from the mid-1970s to the early 1990s. The dispute arose when a rancher decided to build a 28-mile long, five-foot high, woven wire fence around his land which happened to include critical wintering habitat for a large herd of pronghorn antelope. Blocked from their winter range, an estimated 700 pronghorn perished in the winter after the fence was installed. After years of public outrage and litigation, the “rancher” whose goal was to reduce or eliminate the pronghorn so he could mine coal on the enclosed land, lost multiple lawsuits against efforts to reduce effects of the fence and lost the land when his mining company declared bankruptcy. The story ended with Wyoming Game and Fish purchasing 15,000 acres of the critical habitat and establishing the Red Rim-Daley Wildlife Habitat Management area. This is a cautionary tale, suggesting what might happen when critical migratory habitat is left unprotected. With the knowledge resulting from research and presented on the atlas, decisions can be made to protect migrations with various tools – protected areas like national parks, the Wyoming Range Withdrawal Area, and designated Wilderness. Other tools, their recent use profusely illustrated, include conservation easements, highway over- and under-passes at critical pinch points, and fence modifications to allow animals to move over or under them. The 150-mile Red Desert to Hoback mule deer migration provides an example of how many land ownerships and conservation tools can be coordinated over a narrow but long area to sustain a migration corridor. The authors write, “Because there is no mechanism or clear approach to protect entire migration routes in multiple-use landscapes, the only viable strategy is for local, state, and federal stakeholders to work together in a concerted effort.” A coalition of conservation groups has formed to help landowners and land managers protect the long mule deer migration. 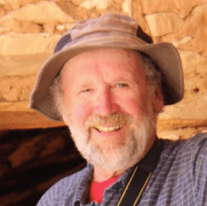 In an article about the atlas, veteran Wyoming reporter Angus Thuermer, Jr. quotes Fred Lindzey, former president of the Wyoming Fame and Fish Commission. “There’s a lot of things we don’t know about why certain paths are chosen,” Lindzey said, but if some oil or residential development has to be forgone here or there, “that’s a small price to pay.” Thurmer notes too that “Thirty years after white-collared pronghorn does showed up in Jackson Hole after trekking 150 miles from the south, Game and Fish still hasn’t designated a corridor for these animals. Meantime, the Bureau of Land Management has approved gas field development … that lies astride the route in southern Sublette County.” The atlas presents the information and suggests what needs to be done but makes no specific prescriptions. Whether it is used for conservation by decision-makers remains to be seen. While large ungulates are the most visible migrants in Wyoming and much of the American West, the most well-known migrations are of birds. Most of their migratory routes are above ground, but there are stopovers, refueling stations, and these must be identified and protected along the east coast and Midwest flyways and that work is well under way. Neotropical migrating birds are in big trouble, for various reasons. Land-bound migrators like ungulates present complex conservation challenges; and these challenges are even greater in the highly populated and developed American East than in the West. For instance, three species of bats are true migrants, summering in the northern United States and Canada then migrating to winter in South Carolina, Georgia, and Florida. Perhaps the most famous migration across the East is that of the monarch butterfly, and many other insects migrate as well. Mapping such migrations and then doing something to sustain them across many political jurisdictions and in the face of climate change is a daunting but crucial task. Migration ecology is of course only one part of the great challenge of rewilding, but an important one; and the atlas of Wyoming ungulates draws attention to the need and the potential of this science. Examining it awakened in me an awareness, curiosity, and the beginnings of understanding of this dimension of the rewilding project. In her forward to Wild Migrations, writer Annie Proulx who has written much about Wyoming, observes that “The essence of the place is compressed into its pages, information so revelatory it seems to stand in three dimensions … The richly detailed pages are also a preparation for the future as climate alteration, increasing human development, and population inflow affect the state.” I would add that works like this are preparation for changes in the natural world everywhere and especially where wildlife migration is part of the ecology.